Colorado DUI – DWAI – DUID Law: Questions And Answers On The Legal Definition Of “Driving” In Colorado? – The answer to the question – “how do they prove I was driving in the DUI case against me”? – is not as simple to answer as it might seem. Many totally responsible people pull off the road for the safety of others and themselves to avoid the inherent dangers in driving while impaired or intoxicated by alcohol and or drugs. Are these people still subject to being prosecuted for DUI in Colorado? While taking the steps to do what is seemingly the right thing to do…. these citizens later find out that the legal definition of “driving” in Colorado can INCLUDE pulling off the road and “sleeping it off” in your car. This article explores the hidden dangers under Colorado DUI law that you must know before you make ANY assumptions that you are beyond the reach of this unexpected danger. 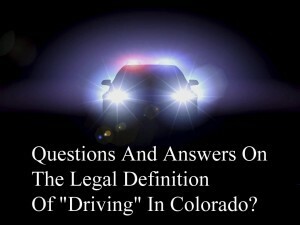 What Is The Legal Definition Of Driving In Colorado? Answer – there is none. The closest definition is found in the definition of “a driver” A driver means every person who drives or is in actual physical control of a vehicle. C.R.S. 42-1-102(27). The Colorado Supreme Court uses this “statutory definition of driving” for purposes of all alcohol-related driving offenses. Ok, Then, What Does “Actual Physical Control” Mean? The Colorado DUI statute – Section 42-4-1301 C.R.S – makes it unlawful for any person under the influence to be in actual physical control of a vehicle. Actual physical movement of a vehicle is not required nor does a vehicle need to travel any particular distance. Since there is no statutory definition of “actual physical control” – the law turns to Colorado appellate cases that help understand this legal term of art. As of the writing of this article – the most recent case on this matter is People v. VanMatre, 190 P.3d 770, 773 (Colo. App. 2008). The “actual physical control factors” arise out of the danger of an intoxicated driver putting a car into motion. When a vehicle is inoperable – that is – not subject to being made readily operable, or being placed in motion – the danger – according to the reasoning behind the factors – is removed. The analysis then – turns on the risk that an intoxicated driver can put a car into motion when the reason for the inoperability of the vehicle is “a temporary condition that can be quickly remedied,” Examples here include when a wheel has been removed to change a flat tire or the when the vehicle’s battery has died. The Colorado cases ALL turn on varying degrees of this theme. The question is asked – under the facts of the individual fact pattern of the case being analyzed, what factors show that the defendant was in actual physical control of the car when the officer contacted him? In the Lounsbury case, 743 P.2d at 27, the court held that the driver was in actual physical control of a car, because he was seated in the driver’s seat, the engine was running, and the car was in gear while being towed out of a snow bank. In the Brewer case, 720 P.2d at 566, officers found the driver in a parked car in the middle of the street, asleep behind the steering wheel. The car’s headlights were turned on, and its motor was running. In the Swain case, 959 P.2d at 427 there was actual physical control when law enforcement officers found the driver asleep in the front seat with the keys in the ignition and the truck’s radio playing loud music. In the Smith v. Charnes case, 728 P.2d 1287 (Colo. 1986) – the driver was in actual physical control of a car when he was found asleep in the driver’s seat of a car, with headlights on and engine running. In the Caple case, 804 P.2d 873, 874 (Color. Ct. App. 1990), the defendant could be “driving” under the DUI statute even though the motor vehicle was not running. The defendant was found asleep behind the wheel with this seat belt fastened. The engine was not running, but the keys were in the ignition turned to the “on” position and the dash lights and radio were on. . In the Warman case, 763 P.2d 558, 560 (Colo. 1988), The motor vehicle was running. The court found actual physical control. The Facts: In February 2004, a citizen made a report to a state police trooper regarding a vehicle in a dirt parking area several hundred feet from a gas station. When the trooper arrived, he saw defendant sitting in the driver’s seat of a vehicle, drinking a forty-ounce can of beer. As the trooper walked towards the vehicle, defendant attempted to start the engine. The trooper told defendant to turn off the vehicle, removed the keys, and arrested defendant. The Defendant was subsequently charged with driving under the influence (DUI) and other charges., aggravated driving with a revoked license (DARP), driving without insurance, and displaying fictitious plates. The Result: The jury ultimately convicted the defendant. The Reasoning: The Court held that a jury is required to analyze whether the vehicle in question was reasonably capable of being rendered operable in order to convict him of illegally driving or operating a vehicle under the DUI. When there is evidence indicating that the vehicle may not have been reasonably capable of being rendered operable, the jury must address this issue. Numerous jurisdictions have so held in adopting the “reasonably capable of being rendered operable” standard. Idaho – actual physical control requires vehicle to be capable of operation, of readily being made operable, or of being put into motion as by coasting or pushing – adopting the reasonably capable of being rendered operable standard in cases where a defendant contests physical control based upon alleged inoperability of the vehicle. Washington State – “reasonably capable of being rendered operable” as a threshold standard for physical control. Arkansas – vehicle may be so incapable of operation that subsequent control over it would fall outside the purview of driving while intoxicated statute. The threat that impaired driving statutes seek to avoid is that a vehicle will be put into motion by an intoxicated occupant and thus pose a risk to the safety of the occupant and others. The risk does not exist when a vehicle is inoperable, not subject to being made readily operable, not in motion (whether by coasting or being pushed), or not at risk of coasting. This is the reasoning that is being applied to the issue of driving in Colorado’s DUI cases… a vehicle must be reasonably capable of being rendered operable before a person can be convicted of “driving” or “operating” the vehicle while intoxicated. In the words of the Colorado Court of Appeals: “These circumstances do not, as a matter of law, render a vehicle not reasonably capable of being rendered operable.” A dead battery is only a condition of temporary inoperability and thus vehicle is reasonably capable of being rendered operable. Even though the motor was not running in the VanMatre case – the fact that defendant was behind the wheel with his seat belt fastened and the keys turned to the on position, indicated that it would take little effort to put the car in motion. Therefore, defendant was driving within the meaning of the DUI statute. ABOUT THE AUTHOR: H. Michael Steinberg – Email The Author – A Denver Colorado DUI – DWAI – DUID Criminal Defense Lawyer – or call his office at 303-627-7777 during business hours – or call his cell if you cannot wait and need his immediate assistance – 720-220-2277. If you are charged with A Colorado crime or you have questions about Questions And Answers On The Legal Definition Of “Driving” In Colorado, please call our office. The Law Offices of H. Michael Steinberg, in Denver, Colorado, provide criminal defense clients with effective, efficient, intelligent and strong legal advocacy. We can educate you and help you navigate the stressful and complex legal process related to your criminal defense issue. Colorado Defense Lawyer H. Michael Steinberg provides solid criminal defense for clients throughout the Front Range of Colorado – including the City and County courts of Adams County, Arapahoe County, City and County of Boulder, City and County of Broomfield, City and County of Denver, Douglas County, El Paso County – Colorado Springs, Gilpin County, Jefferson County, Larimer County, and Weld County,…. and all the other cities and counties of Colorado along the I-25 Corridor… on cases involving …Questions And Answers On The Legal Definition Of “Driving” In Colorado.